Over recent posts here on my site I have featured some of the birds I saw and photographed on a recent visit to the Laratinga Wetlands in Mt Barker, South Australia. As I have stated before, this is one of my favourite birding places to visit because of the large number and variety of birds present all year on the dozen or so ponds which make up the wetlands. Besides, it is about a half hour drive from my home. Apart from the ease of getting there, and the good variety of birds, another benefit is being able to access the various ponds via a great network of walking paths. 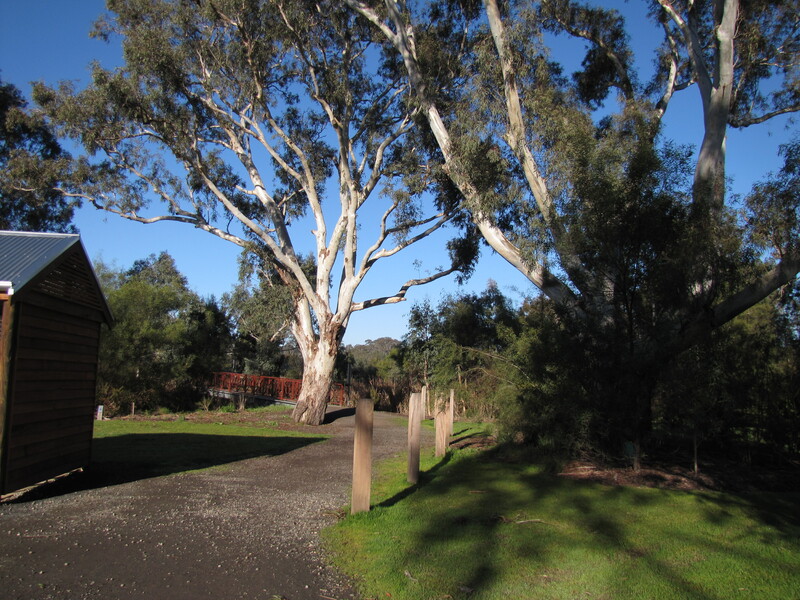 These paths are used daily by hundreds of locals and visitors for walking, running, cycling and birding. From the paths visitors have a great view of the birdlife and this makes photography a delight there. On many occasions the paths themselves afford good photographic opportunities. A example of this on my most recent visit was a small flock of Red-browed Finches drinking from some puddles on the path. Unfortunately the puddles were in deep shade, and the birds constantly moving, so my shots of them turned out very blurry. You get that. On the other hand, today’s photos feature several Dusky Moorhens feeding on the grassy verges of one of the paths – and in full sunlight. 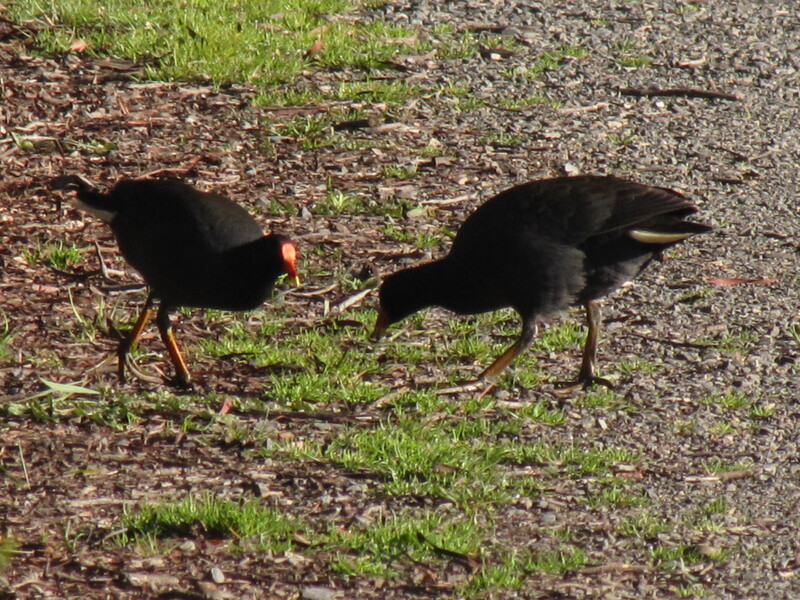 It made it a little easier to get some photos, but on the downside, they were a little skittish. 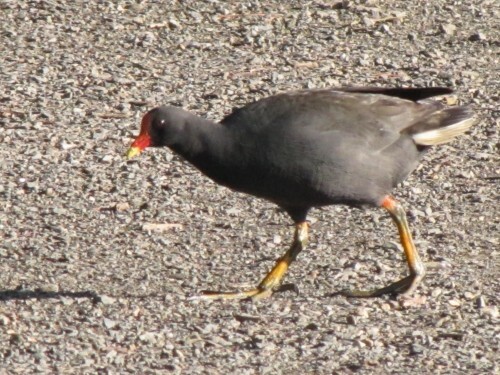 Dusky Moorhens are often found near bodies of water like the Laratinga Wetlands and often associate with both Purple Swamphens and Eurasian Coots. They found throughout the eastern half of the Australian mainland as well as SW Western Australia and Tasmania. 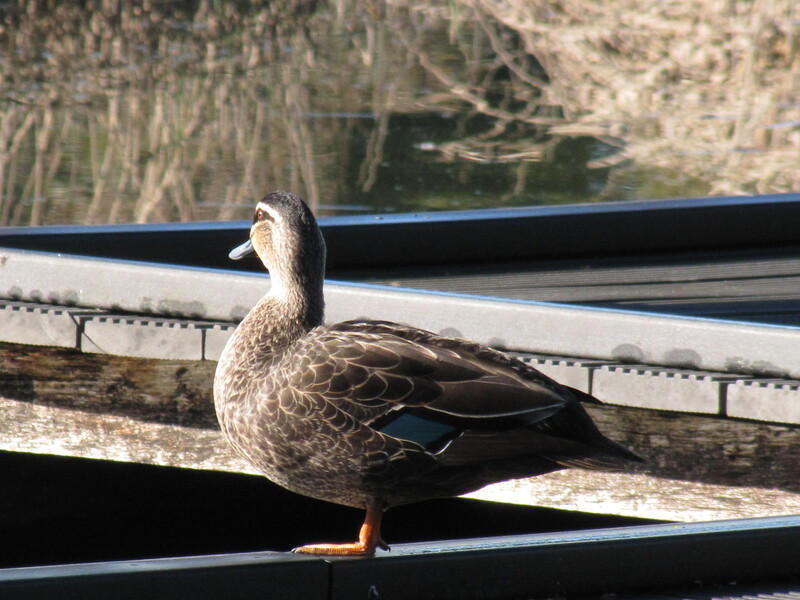 A few days ago I featured a Pacific Black Duck I saw at the Laratinga Wetlands in Mt Barker. 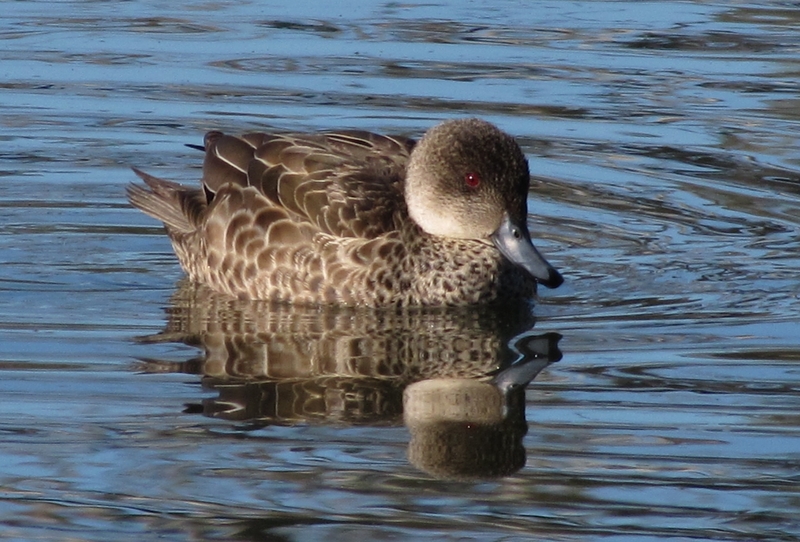 Today it is the turn of another common species, the Grey Teal. This great birding site is just over half an hour’s drive from my home in Murray Bridge here in South Australia. I don’t get to visit often enough. I know of birders who visit this place almost every day. The birding is usually very good with many opportunities for bird photography. The ponds making up these wetlands have wide tracks along their edges and many locals and visitors use these tracks on a daily basis for walking, cycling and jogging. 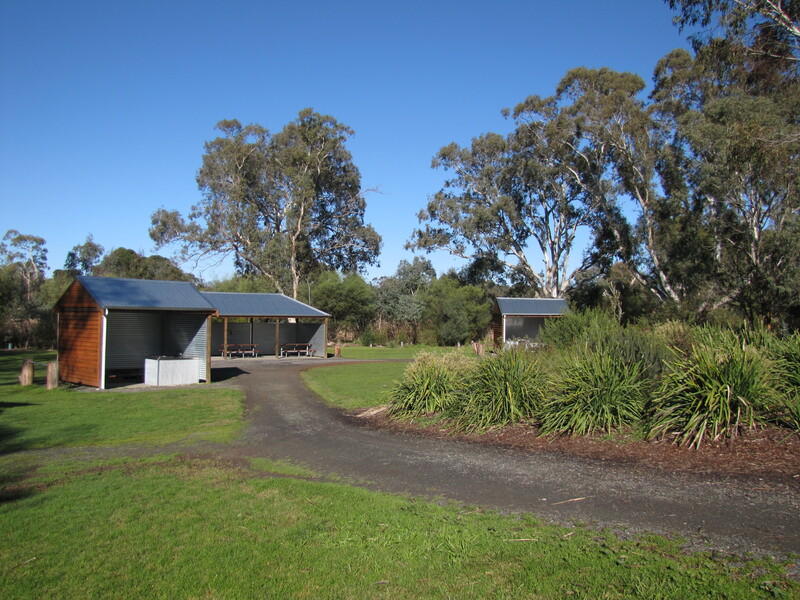 The adjacent picnic grounds are also very well set out and maintained. 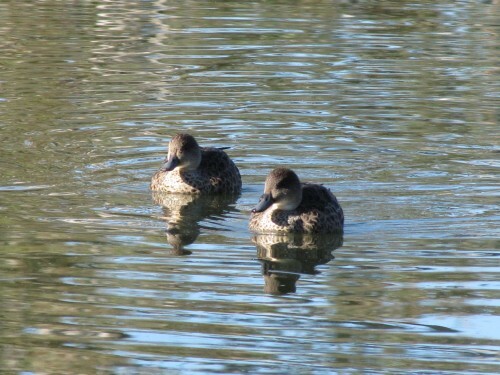 On a recent visit I took these photos of some Grey Teal cruising along across one of the ponds. Many birders and photographers probably overlook this common species. It can be found in many parts of Australia wherever bodies of water exist. I have seen lakes where there were thousands of these ducks. Just because they are common does not mean that they cannot be photographic. I like the photo above, but the one below is something special, in my opinion. The photo has only been cropped a little and has not been enhanced in any other way. For more photos and further reading about the birds of Laratinga, click here. 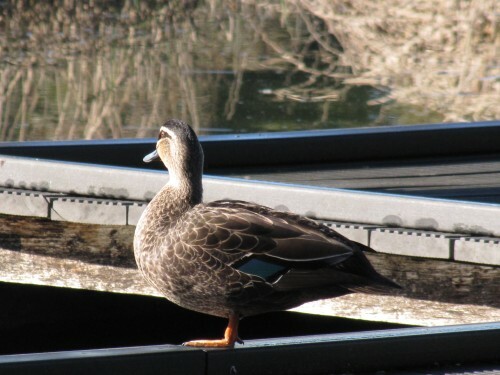 The Pacific Black Duck is a common bird in many parts of Australia. Wherever there is a dam, pond, lake, wetland, swamp, river, estuary or other body of water the observant birder will often see this species, frequently in large numbers. Many tend to overlook this species because they are so common, but I love to photograph them whenever I get the chance. I guess, to be honest, I just like taking photographs of birds. 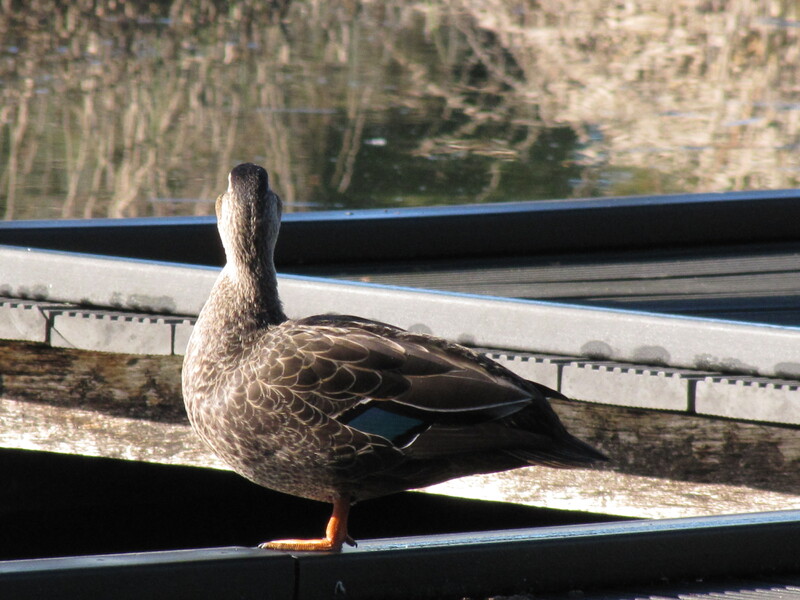 On a recent birding visit to the Laratinga Wetlands in Mt Barker, South Australia, this Pacific Black Duck was resting on the wooden walkway over one of the ponds. I zoomed my camera lens in to get a good shot but it kept looking the other way. I tried asking it to turn my way but it generally ignored me. Eventually it sort of looked towards me – see the photo below – but wasn’t really interested in becoming the next big photographic star on the web. Can’t say I blame it. It was freezing cold that morning. It was probably just trying to get warm in the early morning sun. I will post more photos from from this site of more cooperative birds in the coming days. 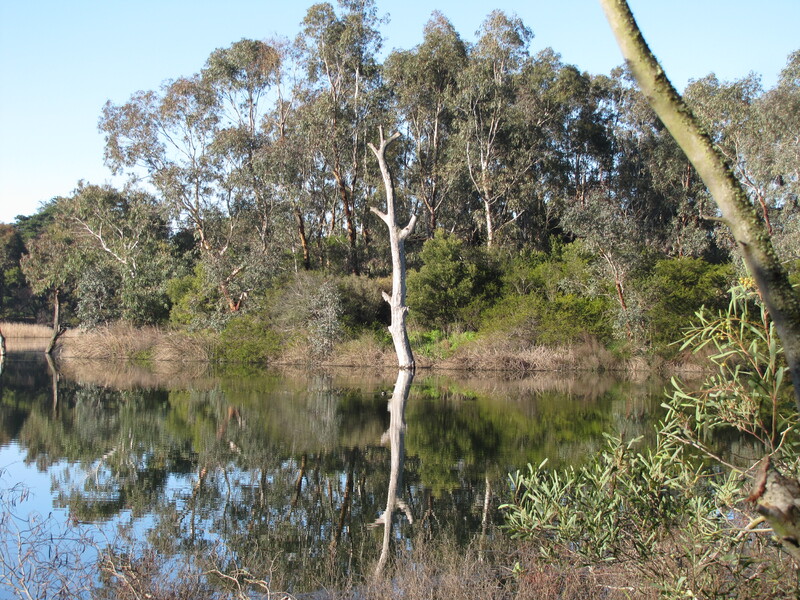 One of the best places for birding near my home is the Laratinga Wetlands on the eastern edge of Mt Barker in the Adelaide Hills, South Australia. It is just over a half hour drive from my home. I have featured birds from this spot on a number of occasions in the past – you can access them by using the search facility above. 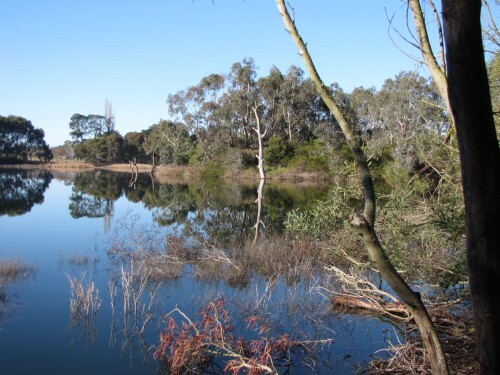 While these wetlands are actually the sewage treatment works for the town of Mt Barker, the area is very pleasant and well landscaped. The treated water comes out in the final pond as reusable for local irrigation purposes. The various ponds have wide, flat walking and cycling tracks around them with plenty of seats to rest and just watch the birds. Hundreds of nearby resident use these paths daily for walking, jogging or cycling and many of them also use the barbecue and picnic facilities. I’m not going to write about the many birds seen here; I will keep that for the coming days. Instead, I am just going to show some photos taken on a recent visit. I love seeing Crested Pigeons. 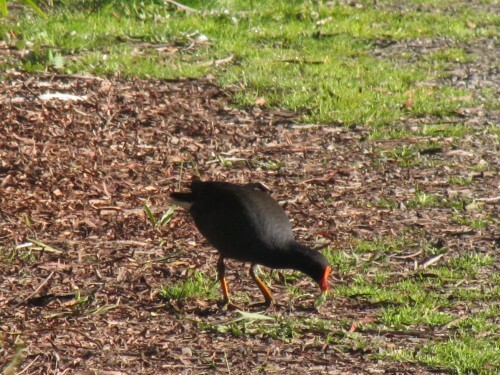 They are a resident breeding species in our garden and five acre block of land on the outskirts of Murray Bridge, South Australia. We see them every day around the house garden and throughout our small patch of mallee scrub. They love coming to our bird baths in the warmer months too which means we get to see them up close and personal on most days. We also delight to see the iridescent colours on their plumage as the sunlight catches the various shades of the rainbow. One thing I have observed in this species is their proclivity towards breeding. They always seem to be courting, mating, nesting, brooding eggs or feeding young. All through the year. No breeding season for them – though one field guide I consulted says breeding takes place mainly in spring and summer but can be most months. A few days ago I looked out of the window towards the bird baths as I was walking through our sun room. 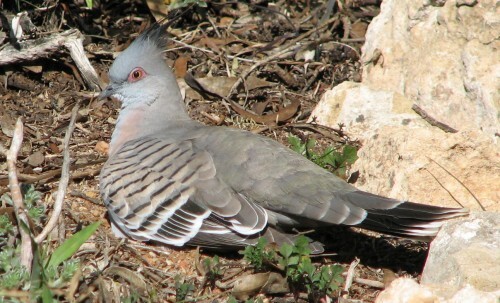 On the ground near one of the bird baths I saw two Crested Pigeons cuddled up to one another in the weak sunshine. We’ve had some bleak wintry weather in recent months. Over the next few minutes they took it in turns to preen one another’s feathers, mainly around the beak, head and neck. It was such a gentle, caring touch and seemed so loving – if I can show a touch of anthropomorphosis for a moment. I didn’t take any photos. My camera was at the other end of the house and there was a stick in the way which would have spoiled the photo. The short episode was over in several minutes but I am sure that my memory of the moment will endure. You are currently browsing the Trevor's Birding blog archives for August, 2015.